Team member Dr. Matthew Carty amputated Jim Ewing’s damaged leg below the knee at Brigham & Women’s Faulkner Hospital in Boston using the AMI surgical procedure. Tendon pulleys were created over Jim’s tibia bone to re-link opposing muscles within the leg. This surgical procedure, named the Ewing Amputation, preserved the normal signaling between Jim’s ankle-foot muscles and his brain. When Jim moves his phantom limb, the re-connected muscles move naturally in dynamic pairs, sending proprioceptive information through nerves to his brain. He consequently experiences natural sensations of ankle-foot positions and movements, even when blindfolded. Rebuilt as a cyborg, Jim returned to the Cayman Islands, the site of his accident, to climb once again. Video courtesy of STAT. 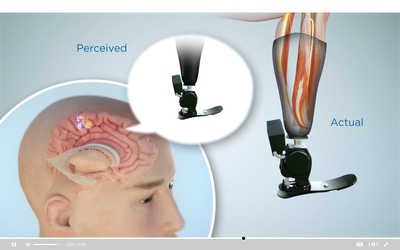 The AMI works to connect the brain to a prosthesis in a manner that more closely replicates the biological control experience.